During this brutally cold winter, the most 311 complaints related to heat have come from tenants in the South Bronx, an I-Team analysis has found. When the outdoor temperature dips below 55 degrees, city law requires landlords to maintain indoor temperatures of at least 68 during the day. When they don’t, one recourse tenants have is to call 311 to lodge a complaint with the city. While Staten Islanders called in less than one heat complaint per 1,000 residents this winter, and Queens logged just two complaints per 1,000, the Bronx has almost 10 complaints about no heat for every 1,000 residents. Manhattan and Brooklyn were in the middle with about five complaints per 1,000 residents. The 311 database does not distinguish between no heat and too much heat, so it's possible that some complaints are for over-active radiators. When someone lodges a 311 heat complaint, it's rare that a city inspector can come immediately to verify, so tenants often need to take their landlords to housing court to get results. 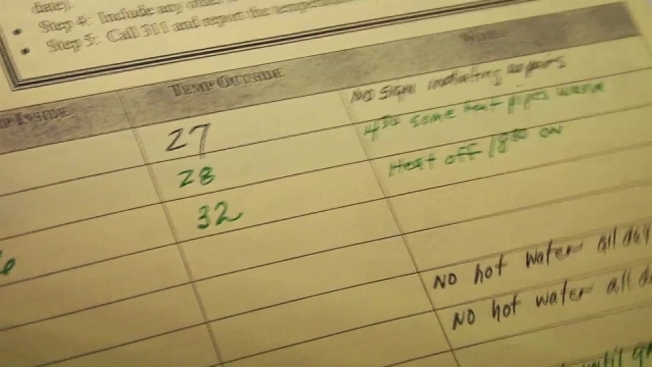 Sometimes they are told to keep a heat diary and try to document the temperatures the best they can. Alfreda Lee says the heat and hot water often goes out in her Bronx apartment, and she often has to heat water on her stove just to bathe. Getting out of bed on those mornings is nearly unbearable. Housing advocates say it’s hard to tell why some neighborhoods generate more heating complaints than others. One reason could be that more people own their homes in Staten Island and Queens, according to census data, so there’s no landlord to complain about. But Susanna Blankley, the director of housing organizing at Community Action for Safe Apartments, said there may be a more sinister reason. In the Bronx, many apartments fall under rent control regulations. In those cases, Blankley said, many landlords may be motivated to push out their tenants so they can legally hike the rent. At 888 Grand Concourse, Lee’s building, there have been 78 new heating complaints made by tenants this year alone, and none have been resolved. The residents have asked a judge to hold the landlord, Louis Bombart, in contempt for failing to fix code violations, which range from a boiler issue to elevator problems. They are awaiting that decision. Bombart could not be reached for comment for this story. In the meantime, cold residents at 888 Grand Concourse say they continue to be vigilant about calling 311 every time the temperature inside dips below legal levels. To find out where your neighborhood ranks in terms of landlord heat complaints, check out this interactive map.